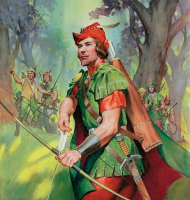 Robin Hood was too busy fighting for social equity to ponder the philosophic roots of his SOP: take from those that have and give to those that have not. But the “redistributive” function of public administration is at the heart of the goal: public administration should strengthen social equity. Social equity was not part of the curriculum when I took H. George Frederickson’s course at the Maxwell School in 1967. Soon after, without borrowing directly from Sherwood Forest analogs, Professor Frederickson was one of the early proponents for adding social equity to economy and efficiency as pillars of public administration. From the start, social equity was linked to policy, but not comfortably. In American style democracy, policy is set through the political process. Political power determines the distribution of services and benefits provided by government. Some programs promote a goal of social equity either proactively or indirectly. The benefits are provided to all without discrimination. Other programs address social inequities. But there is a gap. Some programs don’t promote social equity. In other cases, social inequities continue to deprive the community of human resources that should be cultivated and shared through public programming. In a 2012 Public Administration Review paper, Mary E. Guy and Sean A. McCandless trace the movement for social equity from the recognition that many governmental programs fail to provide services equitably. Enter Robin Hood, Michael Lipsky’s “street-level bureaucrat.” Whether programs don’t advance social equity, or ignore the issue entirely, public programs are implemented by administrators. In using the prerogatives of the street-level bureaucrat, they can bring elements of justice to their world, just as Robin Hood did mythically in Sherwood. Administrators don’t have the final word on the social equity impact of public policy–one of the principles of public administration requires compliance with the policies established by the democratic process. But Sherwood Forest had many trails. Street-level bureaucrats would know the trails that could lead to social equity. What are the prospects for social equity? The prospects are good, but not universal. The major issues of social equity are being addressed at the macro-level of our community. Racial justice, middle-class survival, educational opportunity, gender equality, environmental change and intergenerational equity are part of the often-contentious political dialogue (or monolog). The outcomes are beyond the reach of the public administration profession. However, at the micro-level, public administrators can play a significant role. Community planners can encourage the location of commercial facilities in neglected neighborhoods. Police departments can provide “soft” security through community policing. Public health services can be tailored to meet the needs of disadvantaged communities. Social service agencies might be decentralized to neighborhood locations. Government services could be shifted to nonprofit agencies with better access for the people being served. Intake for subsidized housing programs could be streamlined. Economic development prospects could be pursued to serve those who do not have high-level STEM skills. Stressed neighborhoods could be supported with sustainability services. State and federal agencies can include social equity provisions in program design. Strategic planning: making the arrangements for implementing a service. .
Budgeting: determining who pays and who benefits from a program. Impact analysis: rationalizing the fair and equitable distribution of benefits. Financing alternatives: using current fiscal tools to assure equity. Communication: establishing relationships with policy makers to address social equity issues. The prospects for achieving social equity goals are challenging. Much progress has been made. Robin Hood operated outside the law; public administration has achieved equitable goals within the law. Sometimes success has come from direct programs like Aid to Families with Dependent Children. In other cases, the success has been under the radar like President Clinton’s “stealth urban policy” described by Ross and Levine with programs like the Earned Income Tax Credit. The goal of a just and equitable society is still distant. Urban education has not opened the door to equal opportunity. Gender-related issues are being debated. Income disparity has grown shamefully. Employment opportunities have disappeared for millions of workers. As public servants, we hear the call from H. George Frederickson in 2010 to pursue social equity. His call resounds that we “dirty our hands with inequality that we be outraged, passionate and determined… that we actually apply social equity in public administration.” As public administrators, we can and should answer the call for social equity. Author: Minch Lewis teaches a graduate course in public administration at the Maxwell School. Minch served as the elected city auditor in Syracuse, New York and developed financial management systems for public housing authorities and subsidized housing programs. He Earned an A.B. degree from the University of Notre Dame and an M.P.A from the Maxwell School. Minch can be contacted at [email protected].